Eight new state parks to check out this winter in New Mexico along with returning to two or three that I liked from last winter. Also plan to check out some BLM areas. Should be good. Then back to Bisbee for a month around March to visit friends and take a month or so to work north to Utah. Probably go up the west side of NM; have not been through there yet. There was a good time visiting with friends in SLC. I had a chance to have lunch with my old zen teacher, Genpo Roshi, the abbot of Kanzeon Zen Center and founder of Big Mind (www.genpo.org). He is SO busy these days that I felt truly blessed to have him take the time to meet with me. Life is good. This shows where I parked for a few days in front of a friend's house in Moab. We went to a premier on the life of a Utah legend; Kent Frost is like a Utah John Muir. ‘My Canyonlands – The Adventurous Life of Kent Frost’ directed by Chris Simon. If you like the Utah Canyonlands area or just like nature, look for this DVD when it comes out. Found out there are not a whole lot of places to disperse camp along rt.160 through the San Juan National Forest. Many of the FR are pretty rough and steep. There are some nice places south of Pagosa Springs on rt.84: Blanco Road (FR 656), Kenny Flats, and Buckles Lake Road (FR 663). 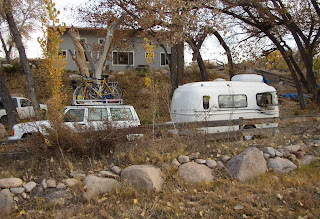 Will have to find out about other places to dry camp between Durango and Pagosa Springs. The shot here is of where I pulled off on Buckles Road. Over four months without going to a laundromat! Got by with doing a handful of items in a 5-gallon bucket every other day. I always bring a book when I go to a laundromat but it’s still not one of my favorite activities, so this was a real treat. After hitting a laundromat in Moab, I came across the most expensive laundromat I’ve ever come across in Chama, NM. At least she had a book exchange shelf where I switched some books. Can’t wait to get back to my bucket. So this is what it looked like one morning. It's been down in the lower twenties a couple of nights. My summer job ended a couple weeks ago and I have just been hanging out enjoying the canyon and the quiet. I went hiking up towards Deseret Peak yesterday with a friend. Really nice. A bit slick once we got into the snow and ice, though. Cathy had brought hot herb tea up and it really hit the spot. Good conversation and exchange of ideas on camping and traveling in small rigs (she has a camper on a Tacoma). 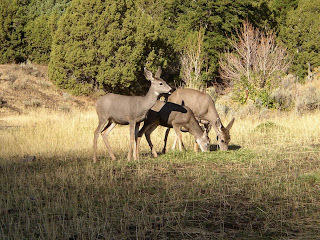 I finally got a closer shot of the deer eating some of the hay I have been putting out daily for the horses. I brought a low-rider chair up to the pasture and just sat there for a while. They kept looking over but Meadow was on my lap and that might have put them somewhat at ease. I made feet for the solar panel out of aluminum angle channel and used 3M VHB double-sided foam tape to install the panel on the roof. 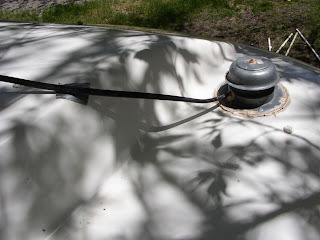 I removed the vent cover and drilled a hole in the base to run the cable through. Then I drilled a hole in the roof right up against the vent so the vent cover would conceal the hole. The cable runs down along the vent pipe in the closet, attached with zip ties. Another hole was drilled in the floor right next to the vent pipe for the cable and then it runs under the trailer along the frame with numerous zip ties back to the battery box with one more hole up through the floor. Sealed all the holes with calk. Never resist the opportunity to learn something new. 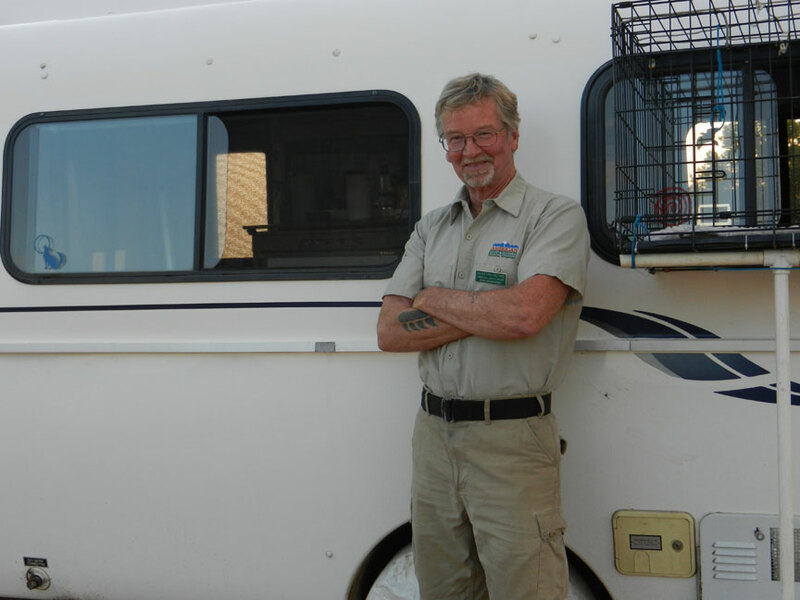 Taking a position as a campground manager for a summer can be a memorable experience. You will regularly hear envious statements from campers saying that they would love to be doing it. Only they can’t afford to do it, time and money-wise, or they just have way too much stuff to be able to leave it all for so long. More often than not, it can be a pretty good job. Many have been doing it for ten or fifteen years. There are also those who quit in the first couple of weeks or in the middle of their first season (not a good thing) or who bag it after the season is up. Some just do not like dealing with the two hours of weekly paperwork. 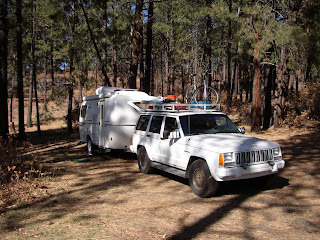 There are also numerous primitive campgrounds out in the national forests if you prefer the company of tenters and small RVers. The roads will not be paved nor will there be hookups. The campground manager’s site, though, will generally have water and maybe sewer. Sometimes a generator is provided. Note the distance from the nearest town. If it is only ten miles or so, you could have some problems. There will be some locals who come up just to drink for a few hours at night and then drive back home. They can leave a mess, cause damage, make a disturbance with the campers, and tend to skip out without paying the fee if you don’t catch them. At least the local sheriff deputies generally don’t mind coming up and taking care of any disturbances. All in all, however, not all peaches and cream. You can weed most of these lowlifes out in the first couple weeks, though. They definitely do not like paying the fee so if they know you will be there enforcing it, they tend to go someplace else the next time. A very good thing and much appreciated by all. Campgrounds farther out, tend to have less of this type of problem. You can get an occasional rowdy group up for a weekend, however. The first night might be rough but they generally get the message. If the campground is large, there will probably be two or three couples managing the sites. Strength in numbers might be helpful, or at least supportive. Also look for campgrounds without any ATV trails in the area. There are definitely exceptions, but those people tend to be a little rougher around the edges and not overly considerate of fellow campers. Large campgrounds with sites not all that far apart, sometimes have fewer rowdy problems since they will have so many other campers telling them to shut up. Granted, there will be exceptions to all these scenarios. Depending on the campground, the biggest problem might be theft. Many just do not want to pay for using a site. Skipping out without paying and stealing the fees is theft but you will hear all kinds of rationalizations for it. Unreal. There will be no problems with those who appreciate and respect our natural resources and the campgrounds. They don’t mind contributing to their upkeep. It can be difficult to deal with the freeloaders. 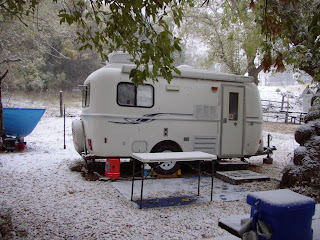 You will find that a good number of people who come to the campgrounds are not ‘campers’. Some pick up a tent and sleeping bags at Wal-Mart and come up to get out of town. Their radio is blasting; the tent is pitched so that if it rains, it’s going to get flooded, and they can have 8 foot logs draped over the fire-pit ring! Clueless. Thank the gods most of the people you will be meeting over the summer are pretty good. One just has to focus on the good people (not always easy). You will have some stellar conversations throughout the season and become friends with some of the returnees or even those just passing through from out of state who you will exchange email addresses with. You will regularly be invited into campsites for morning coffee, breakfast, and dinner or a beer (not a good idea while on duty). Sitting around talking with these campers is one of the best aspects of the job, by far. Then there is also the quiet time during the week when there are only a handful of campers around and you are out and about taking care of the various chores, listening to the sounds of the forest, and watching the wildlife. During the week your days will be filled with: emptying trash cans; picking up, raking, sweeping off tables, and shoveling out fire-pits in sites where campers have been; cleaning outhouses; painting; replacing missing signs; fixing knocked over posts; trimming brush and tree limbs; whacking weeds; possibly mowing grass; sweeping foot bridges and walkways; collecting fees; seeing if campers need anything, answering questions, or just asking how things are going; picking up cans and bottles tossed out along the road; making a weekly run to the landfill; a Monday run to the bank to deposit the week’s take, and various other tasks. The days and weeks can go by fast. For primitive sites, they will probably have you get there a week before the campgrounds are scheduled to open. One will need to clean up all the sites and outhouses so they are looking good for the campers; putting up signs; distribute the trashcans, digging out fire pits, putting out supplies, etc. The end of season wrap-up takes less time, with a final digging out of fire pits, covering up/taking down signs, collecting/storing trashcans, and the like. All in all, it’s not bad. There will be times when you want to throw in the towel. There will be many more times when you are walking around with a big smile on your face, really glad you are doing what you are doing. Find out as much as possible about the campground that you are applying to; why isn’t last year’s manager returning; what will you be responsible for; will the company provide you with a pickup if the roads are rough; how do you handle the landfill runs; day off; and all the basic stuff. The first month I tried a job like this, I was saying, no way am I ever doing it again. I was getting tired of dealing with drunks in the dark around their campfires; free loaders trying to skip out without paying; calling the sheriff at 12:00 at night; dealing with the mess some ‘campers’ were leaving, and the like. But I was also meeting and spending time with some wonderful campers: artists and actors from Salt Lake, a writer from Reno, quite a number of locals, and many more. I just had to learn what to focus on. Getting campers laughing and feeling good about their experience in the canyon really makes one feel good. Walking into the various campsites with a smile on your face tends to set the scene for a more congenial outcome. I’ll be going back and doing it again.